This is the third card I made using the Petal Passion Memories & More Card Pack and the last one of the batch for the moment. It was so easy to put together that there's not much to say about it! 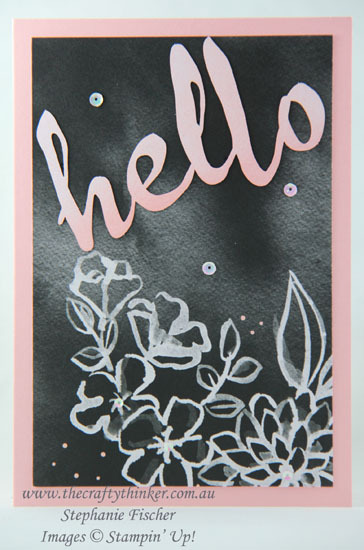 The base card is Powder Pink and I coloured the die cut "hello" (included in the card pack) with Powder Pink ink and a sponge brayer. I added some sequins from the Metallics Assortment and that's all I did! 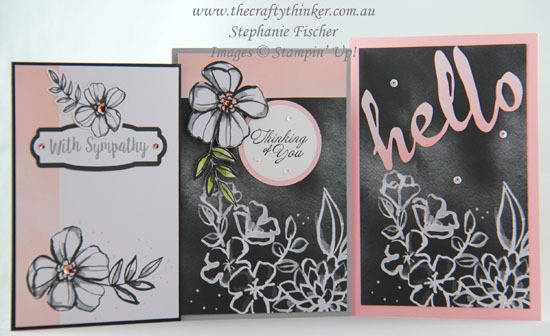 Here are all three of the cards that I've made so far using this gorgeous card pack. Remember that Sale-A-Bration runs until 31st March and is the perfect time to join my team and choose up to $409 of products for $169 (with FREE postage! ), host or buy and take advantage of those amazing freebies with every $90 of products you purchase. Full details are on my Specials & Promotions page.